So, there’s no nail art today because I had a crazy busy weekend- I helped my boyfriend make a movie! We did it as part of our city’s 48 Hour Film Project. (On Friday night you get a genre and some required elements, then you have until Sunday evening to write/film/produce/edit/finish to whole short film.) I’ve never done it before, and it was hectic and nuts (and maybe even a little bit fun). Buuuut as a result of movie-making-chaos from Friday straight until Sunday, I didn’t have time (or brainpower) for nail art experiments this weekend. Never fear, though! I do have an awesome polish to show you today! 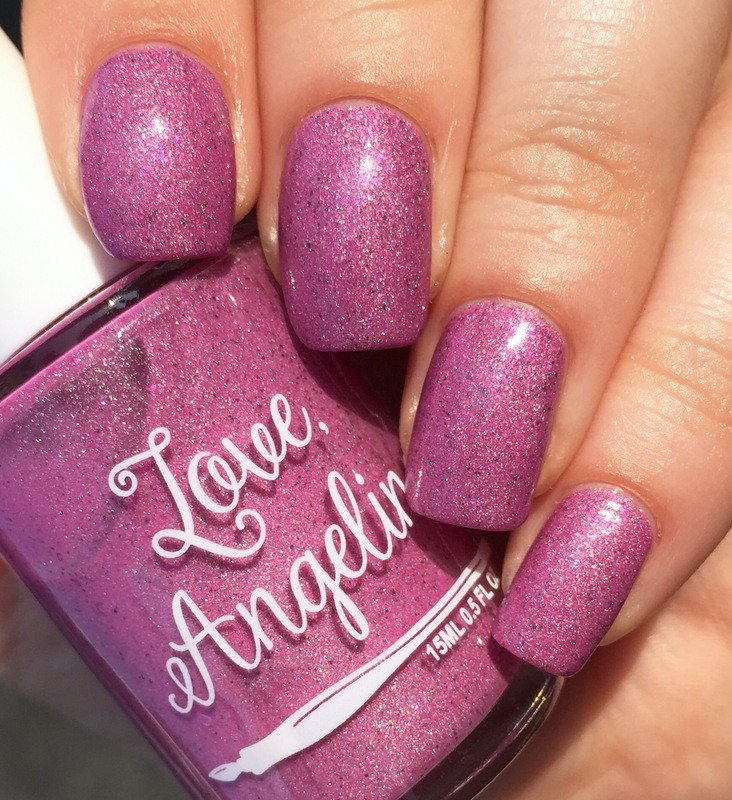 This is Love, Angeline “Surprise!” A warm purple with a ton of depth. It has teeny light flakies and slightly bigger dark flakies, along with a dusting of holo that makes it come alive and glow in the sunlight. As you can see in the shade pictures below, “Surprise!” leans a bit less pink in the shade, but it is still pretty warm-toned. The formula on this was fantastic. It was perfectly opaque in two easy, thin coats, and it was a dream to handle. You can put this one in the “practically paints itself” category (a high honor from me). The best part is that you can get “Surprise!” yourself on Love, Angeline’s website. (I’ll stalk restocks like a panther for what I neeeed, but it’s always a wonderful feeling not to have to wait!) and it’s even available in mini size! Surprise! Such an amazing shade of purple, love the macro shots! I love the depth and warm- I can’t say enough about how much I love this color! Wow, this is a glamorous shade! What a gorgeous shade! I love the complexity of this polish! Gorgeous color! And that film project sounds so fun! This is a stunning polish. Such a pretty color! Great swatch! Gorgeous macros of this polish and the movie project sounds cool!